The aim of this article is to help you select a site, size, and shape for a flower garden and then to fill it with a harmonious combination of plants. 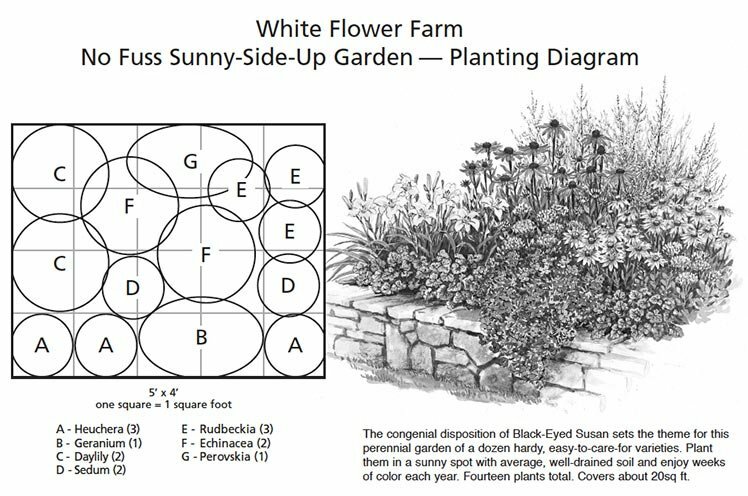 We present this process as a series of steps--seven in all--that takes you from the mere notion that you want a flower garden to a finished plan. If you already have a garden but are not satisfied with it, we suggest that you review the first four steps, then study Steps 5 through 7. 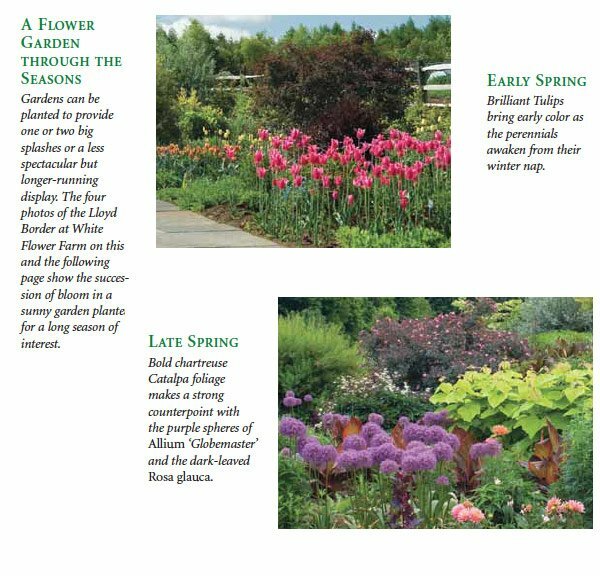 When we say "flower garden" or "border" in this brochure, we mean an ornamental planting, one with well-defined edges and often (but not always) a backdrop of some sort--a house, a hedge, a wall, or a fence. You may be familiar with annual beds and perennial borders, but most gardeners (ourselves included) get greatest satisfaction from what are known as "mixed borders," gardens that contain the gamut of plants--annuals, perennials, bulbs, shrubs, and small trees--for variety and a long season of interest. We want to emphasize at the outset that there is no single "right" way to make a garden. Most experienced gardeners follow guidelines similar to those we offer here, but others ignore them--sometimes to glorious effect. Your taste and desires are what matter, not what your neighbor is planting or what a gardening magazine says you should want. This brochure is meant to help you make choices, not to paralyze you with the fear that you're not doing things just so. Have fun, and if fun happens to coincide with "rules" of design, fine. If not, that's fine, too. 1. Think about what you want. The first step in designing a garden is to decide exactly what sort of garden you want. You're unlikely to realize your dream if you're not sure what your dream is. Do you want to decorate a small square by the front steps with a few annuals, or do you long instead for a sweeping border bursting with perennials? When do you want your garden to look its best? Will a brief but spectacular spring or summer show suffice, or do you want a garden that looks attractive from early spring until hard frost? How much time, energy, and money are you prepared to devote to the task of planting and caring for a garden? Do you want a garden that you can dig and plant in an afternoon and that requires little effort to maintain, or do you prefer a more ambitious project, a garden that will usurp at least a weekend at planting time and require regular attention throughout the growing season? 2. 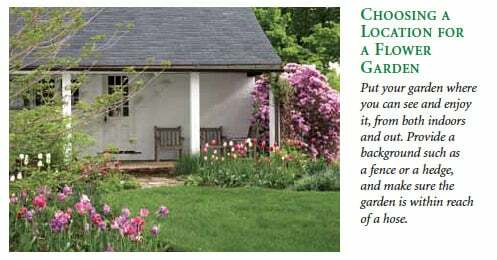 Choose a location for your garden. * Where does a garden "belong" in the landscape? A flower garden is not a self-contained unit. It's a part of the landscape, just as a shade tree is, or a flowering Crabapple or a bluestone patio, and as such it needs to be placed where it will fit in with its surroundings. A border plopped into the lawn or stuck into a corner looks like an afterthought at best, a distraction at worst. A good design is wasted on a bad location. * Where will a garden provide the most pleasure? If you plant a garden in order to enjoy it, then you should probably put it where you spend time outdoors or where you pass often--near the back terrace, along the driveway, at the foot of the front steps, or by the swimming pool. You'll appreciate your garden even more if you can see it from inside the house. Rinsing dishes and tapping away at the computer seem less like drudgery when you can pause to gaze out the window at bright flowers swaying in the breeze. *Where is the nearest spigot? A garden also needs to be within reach of a hose. Even in climates where rainfall is abundant, dry spells are inevitable. If you can't supply water when your plants require it, you risk the unpleasant prospect of watching them gasp in summer's heat. * What sort of background will the border have? Think about the superb garden photos you see in books and magazines. In almost every case, there is something standing behind the exuberant floral display--a fence, a stone or brick wall, a dark green hedge, or a mass of shrubs or trees. These backgrounds prevent your eye from wandering all over the landscape, allowing you to focus instead on the colorful plants in front of you. If the location you choose for your border lacks a good background, consider building a simple fence or planting a hedge. A hedge needn't be a row of tightly sheared Yew or Privet. An informal assembly of shrubs such as Viburnum, Syringa (Lilac), Clethra, Roses, and Hydrangea offers a combination of bright flowers, fruit, and striking fall color, as well as a rich green backdrop for the summer spectacle that unfolds at their feet. If you want to use a border to break up a large expanse of lawn, you may wish to dispense with a traditional background and plant an island bed instead. An island bed stands alone, surrounded by a sea of turf. To be effective, it must generally be large--but in scale with the overall landscape--and it must contain tall plants (4ft or more) either at the back or through the middle of the garden. These tall plants act as a background for their shorter neighbors and give the bed the sort of presence that a small circle of compact plants lacks. * What sorts of plants do you want to grow? Plants have basic needs that must be met if they are to thrive. The most important of these are sun and soil. The majority of flowering plants require full sun to reach their full potential (see drawings). Many will tolerate partial shade with little reduction in bloom, but the number of plants that thrive in full shade is relatively small (though quite a lot larger than most people believe). The point is that if you dream of Iris and Peonies, Daylilies and Roses, Asters and Mums, you'll need to put your border where it will receive ample sunshine. If you put your border in shade, you must be prepared to explore Hostas, Astilbes, Heucheras, Hellebores, Ferns, and other denizens of shady nooks. Soil type is the other factor that determines which plants you can grow. Most plants grow best in a soil that retains moisture reasonably well while allowing the excess to drain away. On the extremes are sandy soils that dry out rapidly after rainfall or irrigation and heavy clay soils that stay soggy long after the rain has stopped. If you site your border on a hot sandy bank or in a low, poorly drained area, you may have to abandon your list of favorites and do some research to discover plants adapted to your soil type. It is possible to amend soil, to change it to suit the needs of plants (see our "Caring for Your Plants" brochure and the cultural instructions booklet under Gardening Help on our Web site), but radical transformation is labor-intensive and expensive. You'll do better to grow plants that like your conditions. 3. Determine the size and shape of your border. A border's size should match the scale of the surrounding landscape (large properties generally require large borders, small properties, small borders) and the inclinations of the gardener. Most people start with a small bed in a sunny spot and are astounded at how fast the space fills up. They then add a few more feet to the front or along the sides, perhaps several times over the years. There is nothing wrong with this gradual approach to garden making. 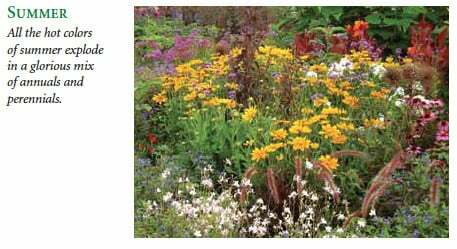 In our experience, it's better to start small and expand as time, money, and interest allow than to be overwhelmed by the demands of designing and planting a large border. The object of gardening, remember, is to have fun, not to pull your hair out because you've bitten off more than you can chew. If you are designing a new garden from scratch, however, you should aim to make it no less than 4 feet deep. A 2-foot-wide strip along a fence or deck barely allows for a single row of plants. A depth of four feet or more allows for a difference in plant height between front and back and for enough variety to hold your interest through the season. In a few years, you may decide to deepen the border to eight or ten feet. Sixteen or 20 feet is not too much if you want to put large shrubs along the back. Should the edges of your border be straight or curved? Straight lines and hard angles suit formal designs, in which borders are given standard geometrical shapes (squares, rectangles, circles). Gentle curves and irregular shapes have a more relaxed, natural, and therefore informal look. Choose a shape that fits your landscape, but don't be afraid to mix and match. Borders close to the house and deck, for example, might be straight-edged, matching the lines of the architecture, while borders along a property line or surrounding a group of trees and shrubs might undulate with the natural contours of the site. 4. Mark and measure the garden. To help visualize the border-to-be, trace its edges with strings tied to stakes (appropriate for straight-edged beds) or a garden hose (which mimics a sinuous edge). Step back and look at the area from various vantage points and adjust the lines to suit your taste. When you're pleased with the layout of your garden, take a can of spray paint (white is easiest to see) and, following the string or the hose, paint a line on the lawn or the soil. Then measure the dimensions of your border. If your border has an irregular shape, take multiple measurements so that you'll be able to reproduce the curves on paper. 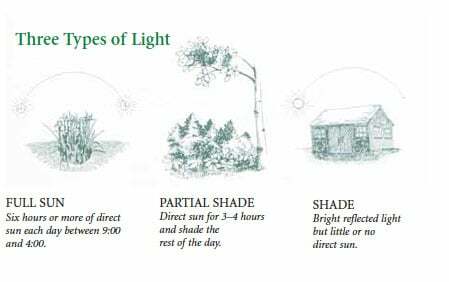 It's also important to note the relative position of anything that is to remain inside the border--a shrub or a boulder, for example--and the location of nearby shade trees, hedges, fences, or other objects that might affect the amount of light that reaches your garden. Now it's time to do some research. 5. Look for plants adapted to your growing conditions. Faced with the seemingly endless variety of plants available in catalogs and garden centers, how do you choose the few you have room for in your garden? Height, flower color, bloom time, and leaf texture should all be considered (and we'll discuss each in some detail below), but the overriding concern of the gardener can be summed up in another question: will that plant grow for me? Plants are living things that have basic requirements for good health. Provide those requirements and your plants will thrive; deny them and your plants will languish or expire despite your best efforts. No matter how good your design looks on paper, it is doomed to failure if the plants you choose are not adapted to the growing conditions in your border. Because trial and error can be frustrating and expensive, the best ways to discover whether a plant will grow in your garden is to talk with fellow gardeners, read gardening books, and consult plant catalogs. The chart at the end of this article lists many good garden plants and, along with flower color, height, and bloom time, indicates their sun and soil requirements. If your new garden will be in the shade and you're at a loss for what to grow, we refer you to the list of plants at the end of the article that thrive with little or no direct sun. Most of the plants are available in either the spring or the fall from White Flower Farm. 6. From the list of suitable plants, make selections according to the basic principles of flower garden design. A single flowering plant can be very beautiful. A grouping of several specimens of the same plant can be impressive. Combining groups of different plants so that each complements the others is the art gardeners aspire to. Here are a few principles of organization that many gardeners have adopted because they work so well. Tall plants at the back, low-growers up front. A plant has to be seen to be appreciated, so it makes sense in most borders to put the shortest plants along the edge, long-legged plants at the back, and the rest in between, creating a gradual slope from, for example, Dianthus in front to Coreopsis, Lilium, Phlox, and finally tall ornamental Grasses at the rear. jumble when seen from a distance. Apart from shrubs and a few large perennials, such as Aruncus dioicus (Goatsbeard) and ornamental Grasses, most plants put on a better show when planted in numbers of three or more in irregular groupings called "drifts." A drift is generally wider than it is deep, and the plants that comprise it are typically arranged in a staggered pattern resembling an upside-down "W," which provides a natural, flowing look. Succeeding drifts are added in overlapping layers to help conceal the joints between them. Planting in drifts means fewer varieties of plants in your border, but those that are represented have much greater impact than single specimens. A few tips on using color. Color preference is very personal. Combinations of color that cause one person to sigh with delight may cause another to wince. So, while entire books have been written on color theory and why some colors "work" together and others don't, it makes sense to begin by choosing the colors you like and experimenting to arrive at combinations that please you. Don't be surprised if your taste evolves with time. 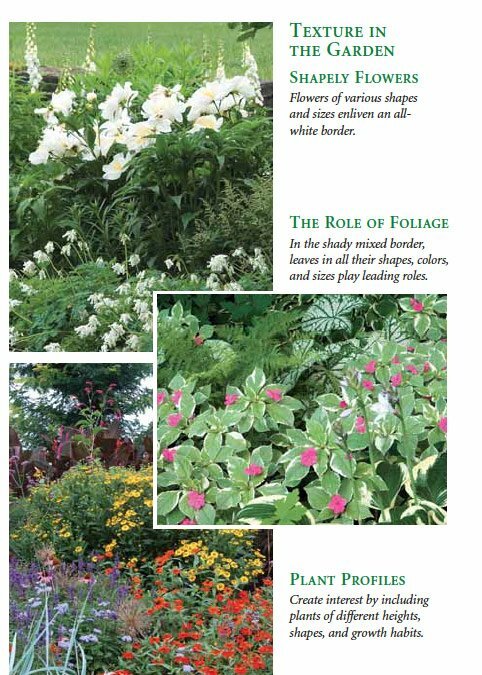 Changing color preference is one of the many reasons gardening sustains a lifetime of interest. * Pastel colors (creams, pale yellows, soft pinks, lavenders) are soothing. They have the effect of a cool drink on a hot summer day. If your border is near the house or near where you sit outdoors, you might want to choose a color theme in which pastels predominate. * Hot colors such as red, orange, and bright yellow tend to grab attention. Use them to make a dramatic statement in a pastel border. A single orange Oriental poppy (Papaver orientale), for example, can draw attention to a whole drift of cool blue Baptisias. And because hot colors stand out at a distance, they deserve the leading role in a border that is located well away from the house. * If you want to separate colors that you fear will conflict with one another, try using blue or white. Both go well with almost all other colors, which allow them to serve as buffers between warring neighbors. Managing the sequence of bloom. Gardeners dream of borders brimming with flowers from early spring through frost, but most bulbs, shrubs, perennials, and even many annuals bloom for a limited period of time. Spring-blooming shrubs such as Rhododendrons and Lilacs, for example, are at peak bloom for just a week, two at most, and such popular perennials as Peonies and Iris don't last much longer. For the budding designer, the big question is whether to devote most of the border to a group of plants that flowers simultaneously, for a superb but brief crescendo, or to opt for a less spectacular but longer-running show. The answer depends on when you look at the border. If you are away on vacation every July or August, then you can ignore plants that bloom then and concentrate on those that bloom earlier and later. If your garden surrounds a pool that is used only in high summer, you can leave out spring bloomers and fall-flowering Asters and fill the space with annuals, Daylilies, Phlox, and Echinacea. But if you see your border from one end of the growing season to the other, you won't be satisfied with just one big splash. * Squeeze in spring-flowering bulbs. No matter how much you crowd your border with shrubs, perennials, summer bulbs, and annuals, you'll still be able to mount an impressive spring display if you plant spring-flowering bulbs. Planted between the crowns of perennials in fall, Narcissus, Tulips, and a host of other early risers will perform magnificently the following spring, while the perennials are just beginning to awaken from winter slumber. The perennials then shoot up and hide the bulb foliage, which withers and disappears as the bulbs enter summer dormancy. Spring-flowering bulbs are offered in the fall by White Flower Farm. * Add a few plants with colored leaves. There are perennials, annuals, and shrubs that are prized more for their beautifully colored leaves than for their flowers. Silver Artemisias, golden Callunas (Heathers), and purple Heucheras complement the flowers of other plants when a border is at its peak and offer welcome dashes of color when blooms are scarce. In the shade, where summer color is at a premium, the two-tone leaves of variegated plants such as Hostas, Lamiums, and Polygonatum odoratum ‘Variegatum', when combined with all-green plants, carry a border right through summer and into fall. A variety of textures brings the border to life. An attractive garden includes a variety of plant forms as well as colors. Contrasting flower and leaf shapes and plant silhouettes provide texture and give a border a dynamic quality even on a calm day. A garden of daisy-shaped flowers, for example, may be colorful and charming, but add the trumpets of Lilies, the spikes of Liatris, Foxglove or the flat-topped heads of Achillea, and the airy cloud of a Gypsophila, and the composition really sings. The same diversity is found in leaves. They can be vaguely thumb-shaped, broad and wavy, grassy, needle-like, lacy, or delicately lobed. Combine and contrast them and your border will hold your interest even when there are few flowers to be found. In a sunny border, try putting the sword-shaped leaves of a Siberian Iris behind the fine, needled leaves of Coreopsis ‘Moonbeam'; set the lance-shaped leaves of a Physostegia against the flowing backdrop of a Grass; or contrast ferny Achilleas with the huge, cabbage-like leaves of Crambe. In the shade, pair the broad, rounded leaves of Asarum with the smaller, heart-shaped leaves of Lamium; juxtapose the finely divided fronds of Ferns with shield-shaped Hostas; or soften the bold, flame-like leaves of Convallaria with the delicate lace of Corydalis. Plants also have a variety of silhouettes. Many, such as hardy Geraniums, Nepetas, Peonies, and Hostas form broad mounds. Ornamental Grasses resemble arching fountains. Garden Phlox, Buddleia, and tall Asters are vase-shaped. Ground-huggers such as Dianthus and the shade-loving Lamiums make spreading mats. And Delphiniums and Alceas (Hollyhocks) throw towering spikes. Once you've narrowed your plant choices and and ruminated a bit on the principles for combining them, you're ready to begin working on a plan. Purchase drawing supplies. The drawing supplies required are available at most stationery and art supply stores. You'll need a few sheets of graph paper (8.5in by 11in sheets with Gin squares are adequate for all but the largest border), a straight edge, sharp pencils, and an eraser. You should also consider investing in some transparent tracing paper, a set of colored pencils, and a compass (the sort used for drawing circles and arcs) or a plastic template that artists use to draw perfect circles. The tracing paper allows you to doodle without having to redraw the basic outline of the border over and over again. The colored pencils come in handy when arranging plants in the border by flower color. The compass (or template) simplify the drawing of accurate circles. Determine a scale. Before you put pencil to paper, you need to determine an appropriate scale for the drawing. Drawing your border to scale (that is, assigning a unit of measurement on paper that equals a much larger measurement of the real border) will help you keep plant groupings proportional and help you determine, with a fair degree of accuracy, the number of plants you will need. The simplest way to proceed is to choose a scale that allows you to fit the entire border on a single piece of paper. There are 44 one-quarter inch squares running across the long side of an 8H by 11-inch sheet of graph paper. If your border is 20 feet long, you'll have room enough for a scale of two squares per foot of your garden (2 squares per foot x 20 feet = 40 squares). If your border is smaller, you can assign a scale with more squares per foot; if your border is larger, you'll have to use one square per foot or perhaps give each square a value of two or more feet of garden space. 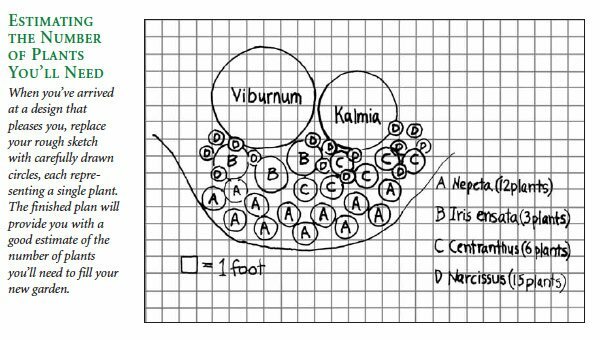 shrubs for example, as circles; show drifts as irregularly shaped blobs resembling the cells you saw through the microscope in biology class. 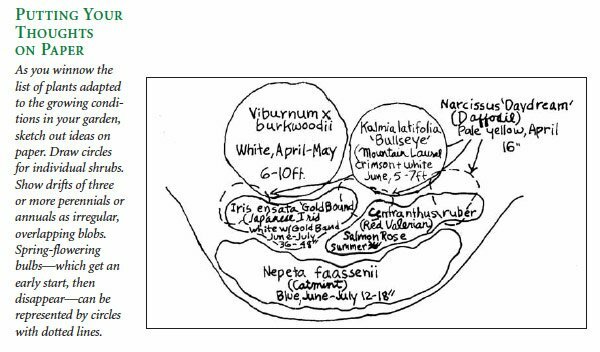 Inside each circle and blob, note the name of the plant and a few key bits of information: flower color, bloom time, and height (see the drawing). Color the circles and blobs with colored pencils to help visualize the distribution of flower and foliage color. Use separate pieces of tracing paper for each month or for each bloom season (spring, June, summer, and late summer/fall, for example) to see how the display will change over time. If you're unsure of where to begin, pencil in the shrubs first. They're often larger than the other plants in a border and they're more difficult to move if you change your mind (you can change your mind) after you've planted them. Then add the perennials, including hardy, summer-blooming bulbs such as Lilies, and the annuals. Because they can be planted between the feet of perennials and shrubs, the spring-flowering bulbs should be added last and the area they occupy should be marked with dotted lines on your plan. This process goes more quickly if you remember that this is your garden and you can plant what you want to. Give your favorites prominent placement and combine them with a supporting cast that shows them to advantage. Once you've made a few big decisions, you'll generally find that the space fills quickly. Estimate the number of plants you'll need. When you've settled on a basic design, the final step is to estimate how many of each plant you'll need. You might think that coming up with this number would be straightforward, but in practice, it's a bit tricky. People have differing opinions on how full a border should look. Also, the plants you buy from a mail-order nursery or garden center will not be full size. Shrubs, and many perennials, require several seasons to reach their mature dimensions. Do you want to wait for the plants to fill in or would you prefer to have the garden look full sooner rather than later (with the understanding that you'll have to do some thinning to prevent overcrowding)? 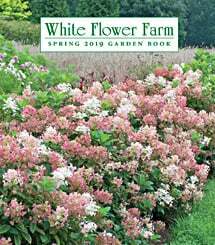 * Consult the White Flower Farm catalog or Web site, the cultural instructions booklet shipped with your order, and the label that comes with every plant for recommended spacing. In most cases, you'll find a range (12 to 18 inches, for example), which is generally equal to the mature spread of the plant. Choose the lower number for a fuller look, the higher number for a more open look. * Lay a fresh piece of tracing paper over your design. * With a compass or a template, draw a circle for each plant that is in scale with your plan. If the scale is one square = six inches, then a plant that spreads 12 to 18 inches wide should have a H- to I-inch diameter circle. Within a drift of like plants, remember to stagger the plants at the points of an imaginary, upside down "W." The points mark the centers of the plants. The distance between points is the spacing (12 to 18 inches in our example). As you draw your circles, you'll probably discover that your plan needs adjustment. To get the show you want from a drift of Garden Phlox (which might require five to seven plants), you may have to reduce the number of Echinacea you had hoped to use or eliminate them entirely. If you left more space along the edge of the border for Nepeta x faassenii than you think it requires, you may want to add some Silver Mound Artemisia to fill the gap. Don't be surprised if, at planting time, you discover you've purchased either too few or too many plants. The translation from paper to reality is never perfect. If you come up short, order more plants or plug in annuals. If you have a surfeit of plants, look around your property for additional planting sites; you can always find a corner that would benefit from a splash of color. With a plan in hand, you can proceed to buy plants, prepare the soil (see our "Caring for Your Plants" brochure on our Web site and the cultural instructions booklet that accompanies your order for instructions on soil preparation), and plant your garden. You'll soon be able to enjoy the flowers you've dreamed of. But your work as a designer has just begun. That's because a garden is never finished. It's a process, an everchanging work in progress, that requires regular intervention on the part of the gardener as the plants grow and flourish (or occasionally disappear.) That's what makes gardening so much fun. There's always something new and different to look forward to.